The basis of a good home audio system is clean and crisp sound. 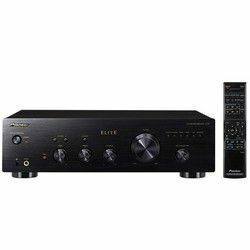 The main component of obtaining high-quality sound is an AV receiver. I had an opportunity to make a comparison of the best stereo receivers under 200. I just want to note that you shouldn’t expect miraculous sound from such receivers. These devices are developed only for playing music or FM radio, which will be enough for an average user. All the devices in the review are affordable models with a limited number of functions and average characteristics. However, despite this, models up to $200 can satisfy the owner's requirements for several years. 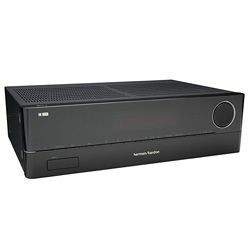 In combination with proper use and proper connection to the home audio system, receivers of this price segment will be able to provide great sound. It is also worth mentioning that inside the receivers there is high-quality equipment, which has a long working life. Also, in terms of software, all modern receivers support all current formats and codecs, and some manufacturers provide long-term technical support for their products in terms of firmware updates. We tested several models of the best 2 channel stereo receivers with support for wireless music playback via Bluetooth. The purpose of this review is to help the reader choose the best model up to $200 based on a small set of requirements. 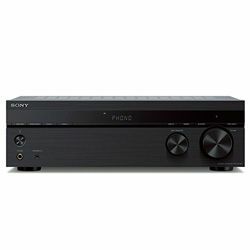 This is a good 2-channel receiver from Sony with the amplifier power 100 watts/channel. It is just a "workhorse" that has a clear sound picture of your favorite recordings. Sony STRDH190 has sturdy design and looks quite presentable as the best stereo receiver under 200. The receiver is rather thin and is made in a dark color. The controls are on the front panel. There is a volume knob and an input selector, a set of buttons for tuning, and a power button. Above the controls there is a small display for only the necessary information. The rear panel is occupied by audio inputs, terminals for the speakers, and the FM antenna connector. The sound is clean and well-balanced for a classic receiver. The Bluetooth features are solid. The receiver can connect to the mobile device if you want to activate that feature, which keeps the receiver in standby mode. Rigid chassis design reduces vibration of inner parts to ensure powerful sound. Bluetooth can work with one device at a time. The receiver can detect FM station only, no AM, but there are many stations that are available online. 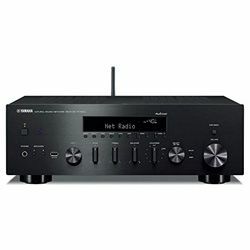 Yamaha R-S202BL is a budget 2-channel receiver with the power of 100 Watts/channel. There is a remote control in the kit with the receiver. It is convenient and has the necessary set of buttons for control. The appearance of the device is minimalistic but attractive. 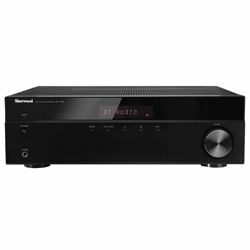 The receiver body is made of black matte metal as it should be in the best stereo receiver under 200 dollars. The manufacturing quality is high, and in general, Yamaha R-S202 gives the impression of a competently crafted device. The rear panel of the receiver has a minimum set of required connectors: analog audio inputs, speaker terminals, and FM/AM antenna connectors. On the front panel there are controls and a small display. 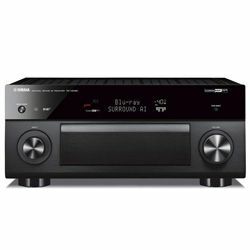 The receiver connects to the home audio system very simply. 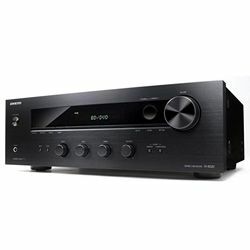 For its power, Yamaha R-S202 has good and high-quality sound; coupled with good speakers, this receiver can become a valuable purchase for a home audio system. The receiver has easy wireless access to streaming music services and music on smartphone via Bluetooth. The set of controls is poor. There are no controls for station tuning or for stereo balance on the receiver, but they are on the remote control. There is no dial for bass and treble, only a few preset choices via push buttons. The receiver has a weak Bluetooth connection, which can be lost any second. This budget model from Pioneer has strict design. The receiver is made of black matte metal. The front panel is occupied by control and display buttons. It is worth noting that, unlike other receivers, all its buttons are made round and some are slightly recessed into the panel. On the rear panel there are terminals for the speakers and analog inputs. 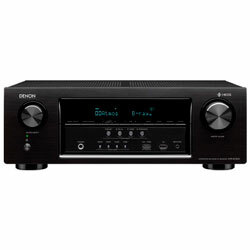 The feature of this receiver is the presence of a line output and pre-subwoofer out. The 2-channel receiver has a power of 100 watts / channel. 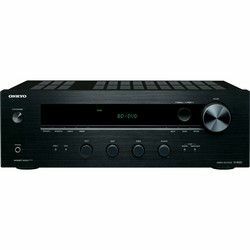 This is the level that you expect from the best home stereo receiver under 200 and it is quite enough for an average home audio system. Pioneer SX-10AE delivers quality and clean sound at the level of more expensive models. 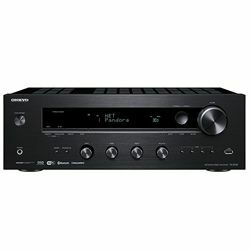 The connection to the system is very easy and intuitive, similar to any receiver in this price category. The receiver has Bluetooth 4.2 and it can stream songs from compatible devices with any mobile OS. Pioneer Sx-10AE has Auto Standby function and it can turn off if it's left uncontrolled. The search for FM stations is slow and unstable. 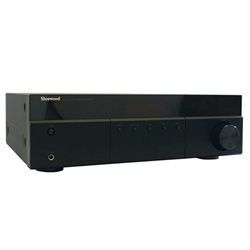 Sherwood RX4508 is a 2-channel model with a powerful amplifier that produces 200 Watts/channel. The receiver is made in a minimalist style and provides high-quality sound. The front panel is highlighted by a minimal set of controllers: only 6 small buttons and a volume control. A little higher there is the glossy panel with the display. A set of connectors is located on the rear wall: terminals for the speakers, audio inputs, and the phono output. 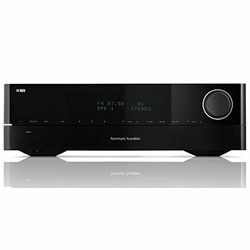 RX4508 creates a tangible sound pressure in the room, but what else can you expect from the best stereo receiver under 200? The volume and tone of low frequencies and high frequencies are adjusted via digital control, and switching is done by an electronic selector. The speakers are simply excellent. The device delivers clear bass and supports the sound range from the lowest fundamental frequencies. Along with the FM/AM tuner with 30 stations memory, the receiver has a built-in radio module that allows connecting any gadget via Bluetooth. The quality of the connection also promises to be high, because the wireless module supports both lossless data transfer profiles and the advanced AptX protocol. Bluetooth connectivity works well and sound quality remains perfect even with old Android devices. Technologies TuneTone Direct & Bass and Treble Controls make the great sound of radio stream. The receiver has a problem with a headphones jack. It works bad and does not give a quality sound. Speaker sound profiles may not meet the needs of some users. They do not have a flexible setting. 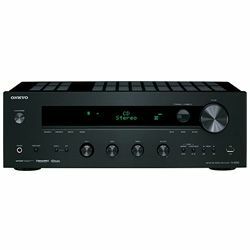 Onkyo TX-8220 is a budget 2-channel receiver. The front panel of the receiver is equipped with all kinds of controllers. This simplifies the tuning of the receiver's sound. The information display with green digits looks a bit old-fashioned. 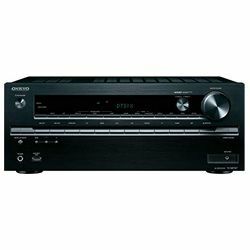 This potentially best stereo receiver under 200 is provided with a sufficient number of connectors. There are terminals for speakers, analog inputs, a line output, subwoofer pre-out, and also digital inputs (coaxial and optical). The receiver includes a wireless technology for streaming audio via Bluetooth with Auto Connect for pre-configured devices. Stable transmission with a low delay allows streaming music from almost any application to deliver richer and more detailed sound. The TX-8220 has enough power for a home audio system - 100 Watts/channel. However, the sound still remains loud and clear. Thanks to a wide range of controls, it is possible to achieve the hogh quality of sound. The TX-8220 has an analog amplifier with the integration of the MM phono equalizer for vinyl players. It can play Hi-res audio, so the receiver can play all FLAC and WMA files, aside from the standard MP3 format. FM/AM tuner has weak sensitivity, and fine-tuning is difficult. TX-8220 has weak volume level through wireless connectivity. The design of the receiver is kept in the style of the RX line from Sherwood. Its black matte case seems big and heavy. On the front panel there are round controllers and a glossy panel with a display. The amplifier has a pair of analog line inputs and 2 stereo outputs. Additional devices can be connected to the receiver if needed. A well-developed system of inputs and switching capabilities will allow to lay all the connections once, and then forget about it, using only the remote control. 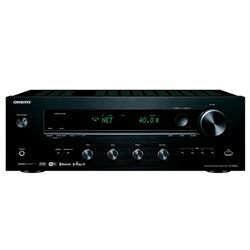 The RX-4208 has the power of 100 Watts/channel , which is more than enough for a 2-channel receiver. Sound meets expectations, as it is clear, detailed, and carefully balanced. 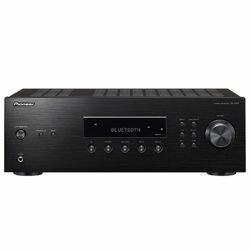 The Sherwood RX-4208 includes support for the Discrete Amplifier Stage technology, thanks to which developers have created a powerful class AB amplifier. Comfortable control via the remote allows you to adjust the basic sound settings with great convenience. The audio device can ensure high quality with a vinyl MM-player, and store about three dozen presets (sets of settings). RX-4208 has no digital connectors. Knobs at the front panel are made of cheap plastic. Strict design in black color gives the receiver solidity. The central facade is occupied by a glossy panel with a display, a built-in joystick on the right, and function control buttons at the bottom, which allows you to adjust the brightness, contrast, and tone control modes. Inputs: five linear RCA, an input of the MM-phono stage, a pair of coaxial, and 1 optical. There are outputs for a recording device and for a subwoofer. There are 4 pairs of terminals for speakers, and jacks for AM and FM antennas. 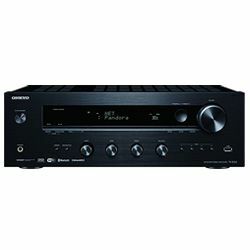 Onkyo TX-8020 delivers 90 Watts/channel power. Its precision, detail, and well-defined bass distinguish the live dynamic sound of the TX-8020. The device uses WRAT technology, which provides high-quality sound in the wide frequency range. TX-8020 has a strict design that can blend in with any home interior. Receiver produces clean, deep, and crisp sound with no distortion and with a bulk effect. Limited control modes, which will not be convenient for those who like advanced customization. Sometimes the receiver makes a loud clicking noise. It is the same sound as the receiver on/off sound. This sound is not pleasant and it hurts the ear. 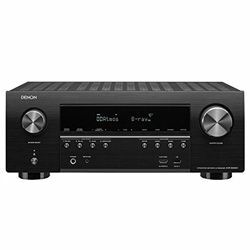 Sony STRDH130 is an entry level 2-channel AV receiver. Its design combines plastic and matte metal surfaces. Numerous control buttons occupy the entire front panel, as there are two controls, an input for headphones and a small display. The quality of manufacturing is high. On the rear panel of the receiver, there is a wide range of analog inputs, the AM/FM tuner, 2 audio outputs, and speaker terminals. 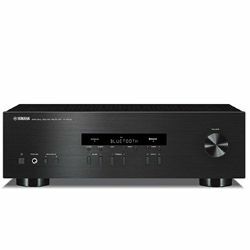 STRDH130 has good amplifier power as a home stereo receiver – 100 Watts/channel. It can produce very pleasant sound with no discernible interference, no distortion at pick volume, and the receiver is capable of driving balanced power to the speakers. Sony has many presets for sound channels. The receiver can turn off automatically if an input signal is not detected. The receiver doesn’t have any digital connectors. It failed to power-up when switched on. The receiver started working again after unplugging and then plugging it back in. Also, I would like to attach a comparison table of all these two-channel receivers. It describes the main characteristics for better visibility.